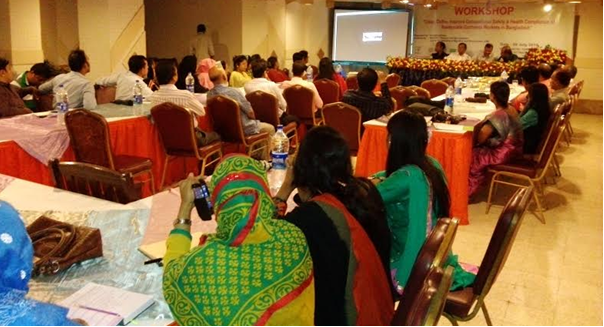 Chittagong, July 31 – A workshop on the safety and health compliance in the readymade garments sector of Bangladesh was held at a local hotel in Chittagong on Wednesday. With the support of German international cooperation agency GIZ and CIM, Europe based development organisation BASUG in cooperation with local partner organisation Songshoptaque organised the workshop. City Mayor of Chittagong Mr A J M Nasir Uddin inaugurated the workshop as chief guest while renowned journalist and City Editor of the daily Suprobhat Bangladesh, Mr M Nasirul Hoque was in the chair. Acting Chief Executive of Songsaptaque, Mr Chandan Chowdhury and Founder President of BASUG, Mr Bikash Chowdhury Barua presented welcome address in the opening session. Project Coordinator of BASUG Germany, Mr A H M Abdul Hai moderated the inauguration ceremony. The panel discussion was addressed by BASUG Advisor and President of BASUG Germany, Dr. Ahmed Ziauddin, Mr M. Nasirul Hoque and Mr Bikash Chowdhury Barua. Among others, Chief Executive of PARK, Mr Nazrul Islam Manna, Health Administrator of Mamata, Mr Mirza Mohammad Ershad, Assistant Director of Ghashful, Anjuman Banu Lima, Managing Director of Clifton Group, Mr. Nasir Uddin, Mr. Jahangir Hossain, Ms. Rita Das from Sunman Group, Mr. Rajib Sen from ODEB, MD of WELL Group Mr. Mohammad Ali, Ms. Khodeja Begum from Arrow Jeans, Mr. Ali Reza, Ms. Yeasmin Akhter, Ms. Moriam Akhter, Ms. Forida Yeasmin, Mr. Chhoton Chowdhury, Mr. Jahid Hassan and Ms. Reba Barua took part in the thematic open discussion. In his speech Mayor A J M Nasir said, garments industry is the soul of our national economy. And the workers are the key players of this industry. That is why, all parties including the industry-owners have to work together to comply with the standard safety and health facilities for the workers to save the garments industries namely the economy of the country. We must keep it mind that the betterment of the workers is not at all a sympathy or kindness, rather it is their rights. If the safety and health facilities of the workers are ensured, the productivity will increase, which will benefit the industry owners in the long run. So for the sake of own interest and social accountability the industry owners have to play pioneering role in this perspective, the Mayor added. BASUG President Mr Bikash Chowdhury Barua said, garments industry is the most important sector from the social and financial consideration of Bangladesh. About 4.2 Million workers are employed in about 5400 garments factories in the country, most of whom are women and more than half of them come from rural areas. Garments sector is the largest exporting sector and the export earnings from this sector is 24.49 Billion Dollar in the last fiscal year from July 2013 to June 2014. In spite of huge growth and the bright future of the garments industry, there are still a number of challenges including safety and healthy working environment in all the factories. In the open discussion a number of concerns related to safety and health issues were expressed, which included workers-owners relation, pregnancy and maternity leave, water and sanitation, setting up of day-care centre, enforcement of the existing rules and regulations, minimum wages, overtime benefit, betterment of the living and housing condition of workers and integrated effort in bargaining with the international buyers.